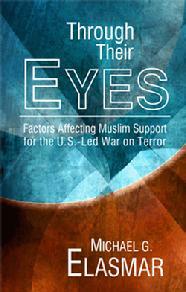 What Influences Muslims� Support for the U.S.-Led War on Terror? That was the key question mass communication scholar Michael Elasmar sought to answer when he analyzed data on citizens in seven countries with substantial Muslim populations, including Lebanon, Egypt, Turkey, Indonesia, Pakistan, Nigeria, and Senegal. Using a theory-driven quantitative structural model, Elasmar found that Muslims� support for the U.S.-led war on terror is higher among Muslims who have more positive attitudes toward the United States, who believe the United States is not ignoring the interests of their countries and who consume more U.S. entertainment media. Through Their Eyes is one of the most significant studies to emerge from the research since the 9/11 terrorist attacks and no doubt will have public policy makers, diplomats, citizens, scholars and students pondering the results for years to come. Michael G. Elasmar (Ph.D., Michigan State University) is director of the Communication Research Center at Boston University, a position he has held since 1994. He is also associate professor of communication research at Boston University and the founding editor of the American Journal of Media Psychology.